I bought a new calendar last week. I brought it home and I put it on the kitchen table, still in the bag, for a couple of days. I knew I needed to take a look at it and see how many days I had left to meet my blog goal, but I was still (am still) fighting a cold and I didn’t want to face it. Eventually the need to know was stronger than the need to avoid the whole subject, so I took out my new calendar and I counted the days left until my blogiversay. There were precisely twenty. How bizarre and what a coincidence! I needed exactly twenty more paintings to meet my blog goal for the year. The message was clear: it was time to start doing one painting per day. I hauled out my paints. 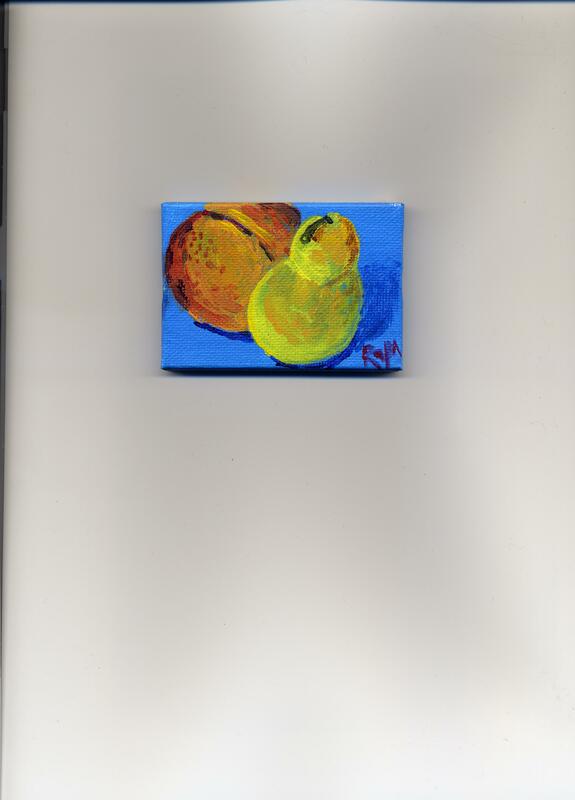 I found a tiny canvas (hey, I said fifty paintings; I didn’t say what size they had to be) and I found something to paint. 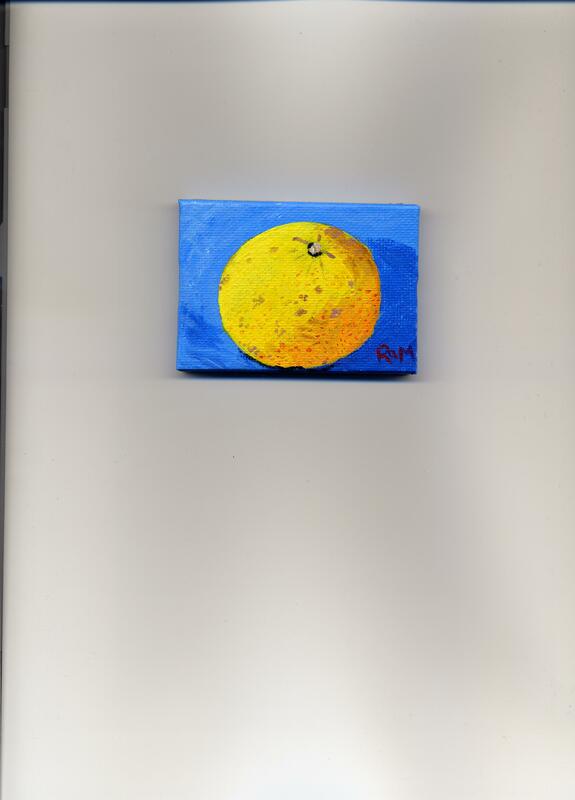 It had been weeks since I had tried to paint, so I picked something easy – a nice, round grapefruit. I have to admit, I was a bit nervous about starting again after such a long break, but the minute I picked up the brush, it felt like coming home. It felt like diving into a well-loved book or stepping into a warm bath – or taking a well-loved book and reading it in a warm bath. Is it a good painting or a bad painting? Who knows? Who cares? I painted it and while I was painting it, I lost myself in the process. That’s the reason I want to paint. Okay, so that one was a great learning experience. I don’t hate it and I’m glad I painted it. Today is the third of the twenty days and I decided to do something that looked as if it would be easier, a couple of bananas I found in my kitchen. I tried to find something round, but there just wasn’t a round fruit or vegetable in there that I hadn’t already painted. There were bananas. 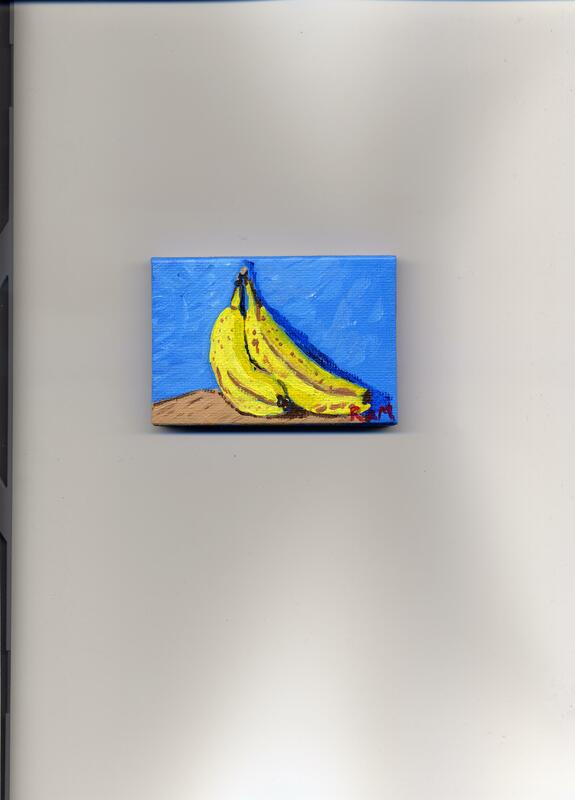 I painted bananas. So far, so good. Three days, three paintings. Here’s hoping I can keep this up for seventeen more days. 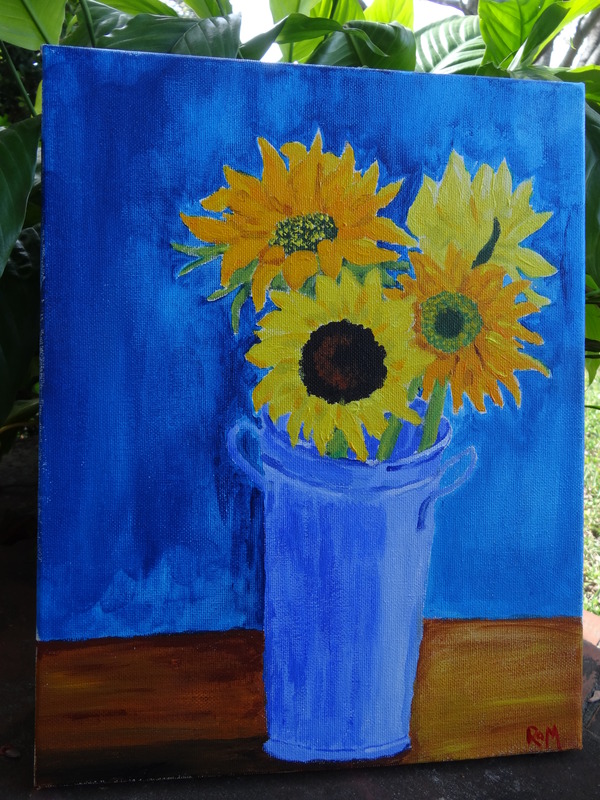 This entry was posted in Uncategorized and tagged blogging, goals, painting on January 21, 2015 by releaf1954. Wednesday is here again. When I looked at my 2014 blog stats last week, the one thing that stood out was the reliability of the Wednesday blog post. I tried different days in the beginning of the year, but once I landed on Wednesday, some time in May, I stayed there. The graph is a straight line after that, a blog post every Wednesday from May through December. I like that straight line. I like being able to depend on myself to publish something every Wednesday. Maybe not something brilliant, maybe not something wonderful, but something. The reason that line is so reliable is that I gave myself permission to just be honest, even if that made for a lame blog post. I’m here, I show up and I tell the truth. That’s all I need to do. The truth about today is that I have a cold. I have had it for about two weeks and I’m tired of it. I am also cranky. I visit Facebook and I see all these posts about all these wonderful resolutions folks are making and they just make me tired. I need to rest, not make resolutions. I will do stuff in 2015, really I will, but I’m not going to post on Facebook or on my blog about what that stuff might be. There will be stuff, okay? If you are a follower of mine, you know what I’ll be doing between now and my February eighth blogiversary. 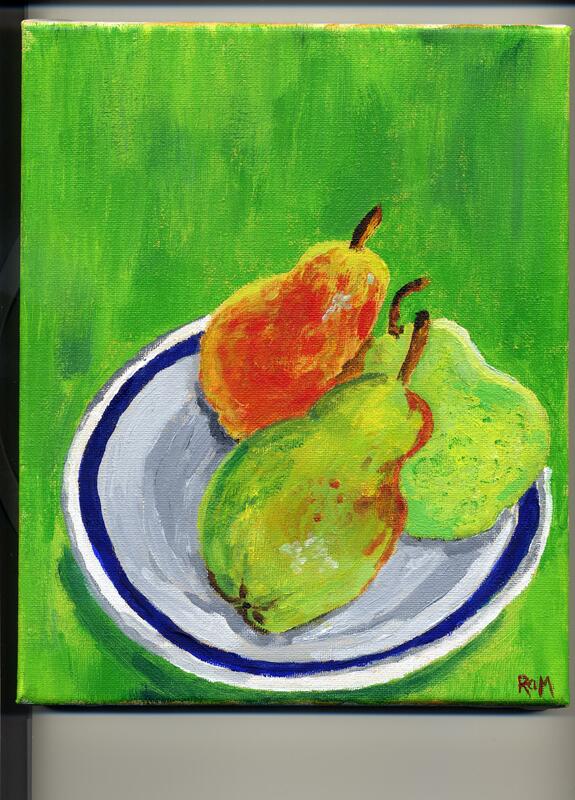 My goal for this blog year is to paint fifty paintings and I have painted thirty. 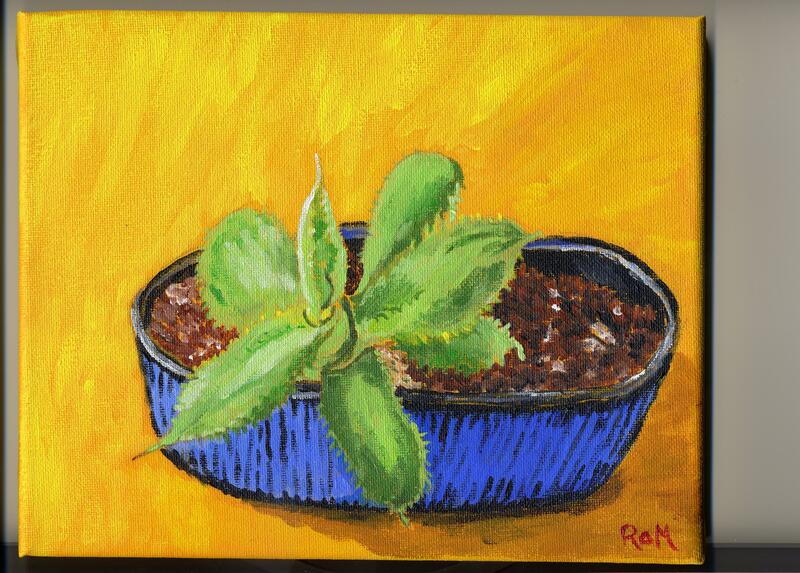 I mentioned this last week and I hoped I would be able to report this week that I had painted, but, alas, I have not. I realize what this means. It means I’m going to have to follow up the December Sketch-a-Day challenge with a similar painting challenge if I’m going to have any hope of meeting my goal. For the record, I did complete the December Sketch-a-day challenge. As far as I know, I am the only person who did. When I say I will do something, I will move Heaven and Earth to get that thing done. This makes me pretty careful about what I say I will do. I’m not making any New Year’s resolutions. Blog goals seem to work for me, because the need to post something every week holds me accountable. I don’t have a lot of followers but I value the ones I have because they bear witness to my struggles and to my mistakes and to my successes. A few good friends and relations read every post and comment on almost every post. You know who you are and I hope you know that I treasure your contributions. You are the reason I keep showing up. Thank you. This entry was posted in Uncategorized and tagged blogging, followers, goals, painting, resolutions on January 7, 2015 by releaf1954. I’ve been around the blogosphere long enough to know that there are bloggers out there who are so organized, they not only publish on a regular schedule, they have several drafts on hand at any given time. All they have to do is pick one and post it on blog day. I am not one of those bloggers. I do have a regular blog day. Sometimes I even think about starting to write my post ahead of that day, but I never actually do it. I also think about starting to write my post early in the morning of my blog day. I don’t do that, either. I might think about my blog during the week and consider different ideas, but I always end up putting off the actual writing until my blog day bedtime is breathing down my neck. This does not allow for unforeseen circumstances, such as getting no sleep at all the night before my blog day. There’s no good story that goes with that, just a weird panic attack in the dark. It doesn’t happen very often, but when it does happen, I have to get up and go in search of light. I try not to disturb my poor husband, who needs to sleep before rising early and heading out to a soul-sucking office job every weekday morning. I just grab a flashlight and go to the living room, where I can turn on a real light. Or two or three, plus the television. Last night, I picked up my iPad mini and played every game on it to calm myself down. That kept the panic at bay but I didn’t really feel calm again until I went to Facebook and saw a post from a friend who lives in Europe. Hers was a “Good morning” post. She was drinking coffee and writing Morning Pages. That was when I started to believe it really would get light again. It was already light in other parts of the world. I’m often surprised at the things that help when the anxiety is trying to spiral out of control. One evening, it was a PBS teaser for a show about Ireland. The minute I heard those Celtic fiddles, my anxiety started to melt away. For me, the least scary darkness of all is a darkness filled with fiddle tunes. Why am I telling you all this? Because I need a blog post and I’m too bleary-eyed to come up with anything clever or profound. In such situations, I default to the truth. This is what happened to my blog day. On the upside, I have a couple of paintings to share. 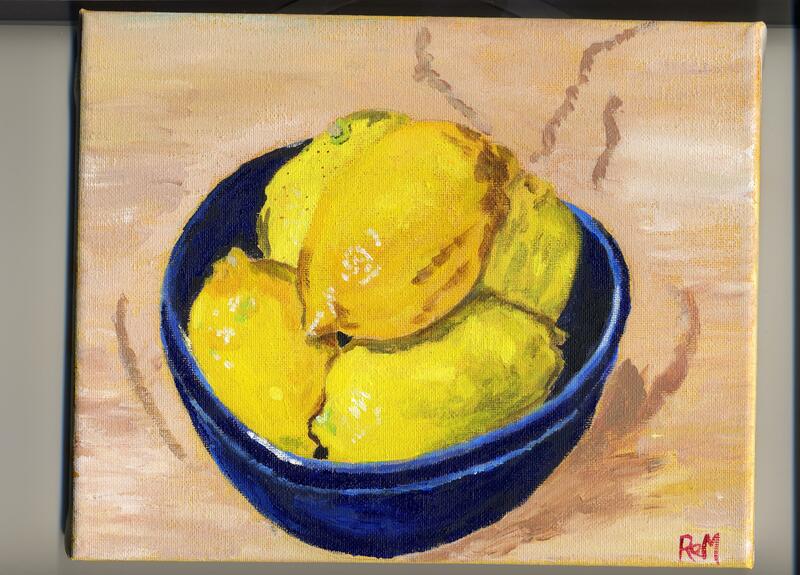 These are the latest in my series of paintings of things I happened to find in my kitchen. This time, I found a peach and a pear. 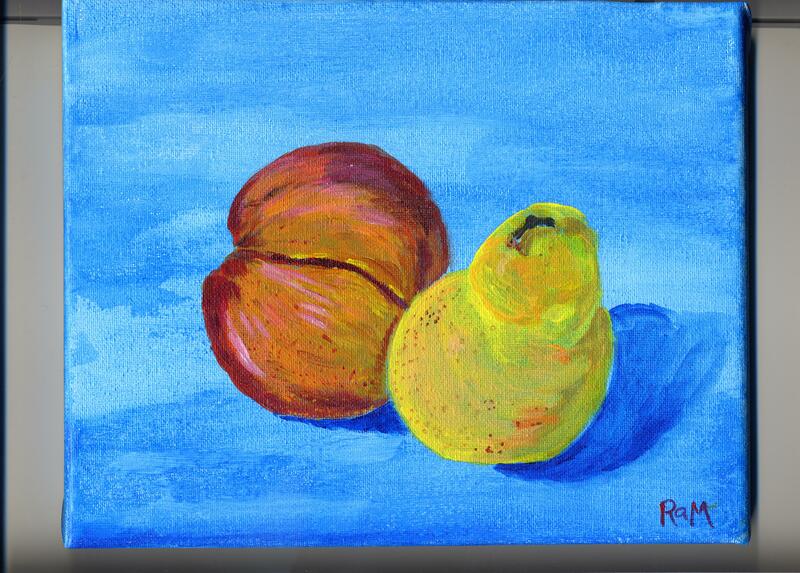 I painted them first on an 8” x 10” canvas and then again on an itty bitty canvas. As you can see, orange is still my nemesis. Some day, I will make it my friend. This entry was posted in Uncategorized and tagged anxiety, blogging, painting, panic attack, procrastination on September 24, 2014 by releaf1954.